Low R-Value. Tanks with a low r-value, or poor insulation, are more vulnerable to freezing temperatures and heat loss. Concrete and underground tanks typically have a higher r-value and are less prone to ice formation. Tank Shape. Tanks with a high surface area to volume ratio, such as a standpipe, are more susceptible to ice formation. It is very challenging to force warm water entering the tank up to the top layers of a standpipe to prevent ice. Surface Water. Utilities using surface source water will experience greater water temperature swings during the year, and greater propensity for ice formation in tanks. During the winter, the temperature of surface water entering the tank can fall to close to freezing. Low turnover. Tanks with little to no turnover, such as tanks used for fire protection, are at a greater risk for ice formation. It is important to have the warm water entering a tank mixing with the rest of the volume to prevent ice at the top of the tank. Poor Mixing. Water coming into the tank between 32-40° is actually denser than ice water and will remain at the bottom of the tank unmixed. This causes freezing water to float to the top of the tank and form ice. Active mixing forces the warmer, denser water on the floor of the tank up to the top, and keeps all the water in the tank at a constant temperature. 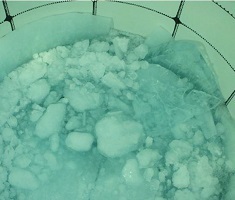 To learn more about ice formation in tanks and how active mixing can help prevent ice, register for our free 1-hour webinar "Keep Water Storage Tanks Iceberg-Free this Winter" on September 24th.